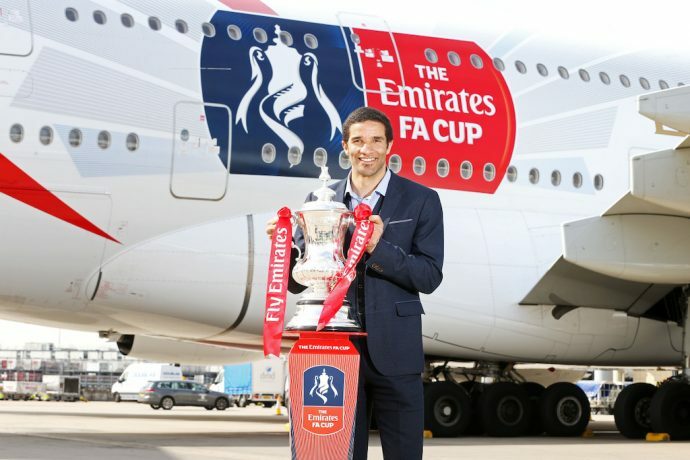 Emirates and the FA Cup elevated the excitement for the tournament with the unveiling of an Emirates FA Cup themed Airbus A380 aircraft. The bespoke design was presented just ahead of the Emirates FA Cup semi-finals which will be held on 23rd and 24th April. For its maiden voyage, the specially decked out Emirates FA Cup A380 flew to London Heathrow today, operating as EK001. The aircraft was met by former England and Liverpool goalkeeping legend, David James who was pictured welcoming the aircraft with the trophy. The Emirates FA Cup emblazoned aircraft will return to Dubai as EK030 and then continue on to Seoul, Madrid, Paris and eventually visit the 37 destinations served by the Emirates A380 worldwide.